M & R Tomato was started by Milton Tambor (our uncle) and Jack Tambor (our father) in the early 1950's and began operations in the Washington Street Market in Manhattan. In 1958, Jack took over and expanded the business. M & R Tomato Distributors, Inc. developed an impeccable reputation for quality, honesty, fairness and quickly became a leader in the tomato industry. When the Hunts Point Market was built in the Bronx, New York, our company relocated from Manhattan and is an integral part of the largest produce market in the world. In the 1970's, Jack's children (Denise, Bonnie and Michael) got involved and evolved the business. M & R Tomato remains a family business run by Michael Tambor and Denise Goodman. We take pride in the fundamental values and reputation that our family worked so hard to achieve. Our reputation for quality, fairness and integrity continues to make M & R Tomato what it is today. We value our relationships with both our customers and suppliers. M & R Tomato was started by Milton Tambor (our uncle) in the early 1950's and began operations in the Washington Street Market in Manhattan. We are able to offer a full line of fresh high quality products. 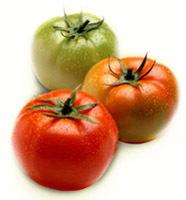 © 2011 M&R Tomato Distributors, INC. All rights reserved.